If you’re like a lot of bobbers, you love solving puzzles. But can you puzzle your way out of a locked room? Escape rooms challenge you to do that in under an hour. 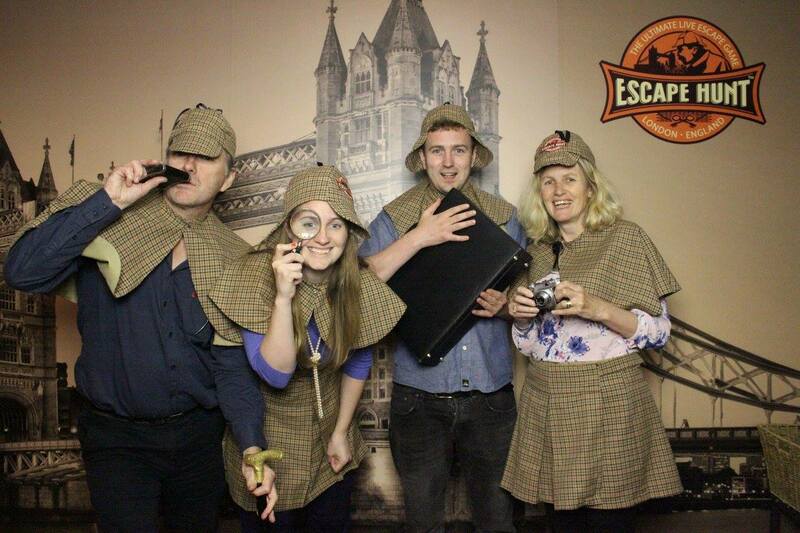 There’s no such thing as a bad escape game, at least not in London. In fact 9 of TripAdvisor’s top 20 Fun Activities in London are escape games. There are currently 16 London rooms, with most venues having multiple puzzles to solve – and some have multiple copies of the same puzzle, so two or more teams can race each other simultaneously. They’re a thinking bob favourite – we’ve been to 13 of them – and our success rate is a lot better than average! 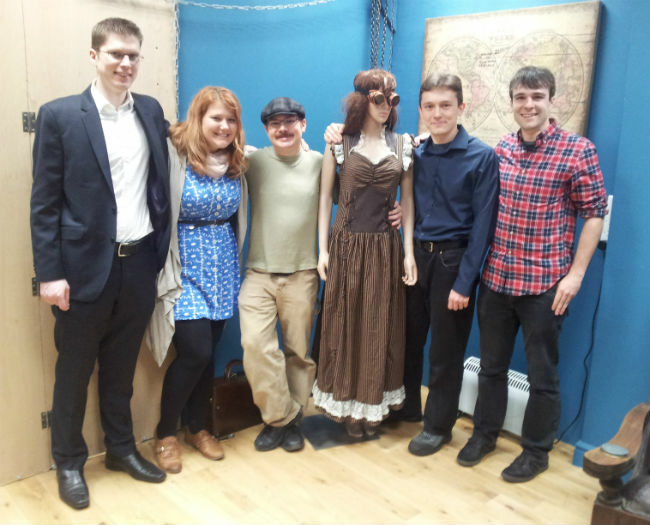 They’re one of the oldest escape games in London, but clueQuest’s experience was so strong even back in the early days that it still holds up well, and their variety of puzzles is probably their biggest strength. There are plenty that give you that great “aha!” moment when you finally work out what needs doing – particularly the mystery of the red box in their “Plan 52” room. clueQuest seem to realise how important details are to making a complete experience. The puzzles sat on the table in the waiting room and the team photos that you take on the day all make you feel like you’ve done something more than spend an hour in a room. clueQuest are set to open their third room, Revenge of the Sheep, sometime in the near future. clueQuest has two puzzles to solve, both of which allow racing between teams. A lot of escape games use padlocks to control access to puzzles, and in those games you end up spending a lot of time trying to work out which is the right padlock to open next. Escape Rooms in London Bridge bucks the trend here, and has a much more high-tech escape game. With sensors and all kinds of electronic wizardry behind the scenes, solving a puzzle or putting an item in the right place automatically unlocks the next clue or puzzle. This means they’ve been able to build puzzles that you won’t be able to see anywhere else, and have put together a great couple of games. I slightly prefer their museum-heist themed game Room 33, because it has a particularly unique start to the game – but you’ll have to play to find out what that is! Escape Rooms has two rooms to play. As escape rooms go, Time Run has the most elaborate production in London by a mile. The game leads you to various points in space and time, and each area’s set and puzzles are heavily themed around the location. As well as your overall time, teams are scored on the number of hints they receive, which are drip-fed to you whenever you appear to be struggling with a puzzle. This helps keep the game flowing, although sometimes you feel you would have got an answer if you’d had a little more time. The intricate design comes at a steep cost though, at a peak price of £35. But the game does hold up with larger teams. There are also lots of things for players to be getting on with at once, and this bodes well given that the game had design input from Dean Rodgers who is also producing the upcoming live Crystal Maze experience. Time Run currently have one game to play, suitable for 3-5 players. 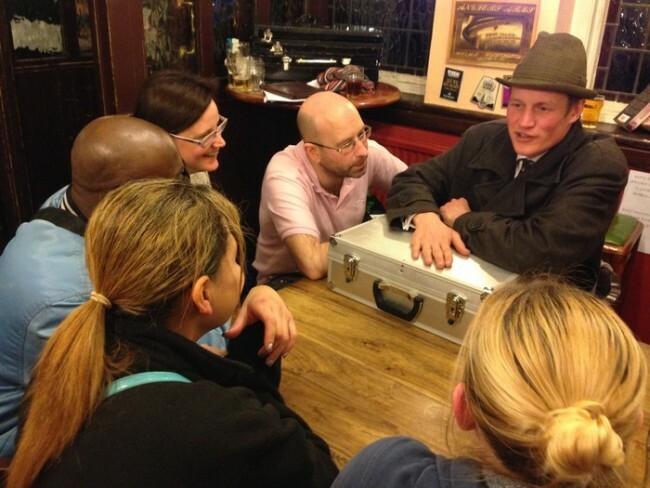 A brand new venue, and the first escape game to start in London after Kickstarter funding, Enigma Escape have made an effort to fit their puzzles to the setting of their game, rather than having abstract, unrealistic puzzles that wouldn’t make sense in context (“Why would the professor scatter the combination to this lock around the room?”). With five players we found it a little crowded, and the videos before and after the escape felt a little tacked-on, but the game is fun regardless. Enigma Escape currently have one game to play, suitable for 2-5 players. A steampunk theme is a great excuse to dress up an elaborate escape room set, and we’re sure Escape Land had a lot of fun putting Escape from the Age of Steampunk together. The theming is still a little bare though, and the space feels slightly underused, but that’s probably a deliberate choice because it makes the room fully accessible for people with mobility disabilities. 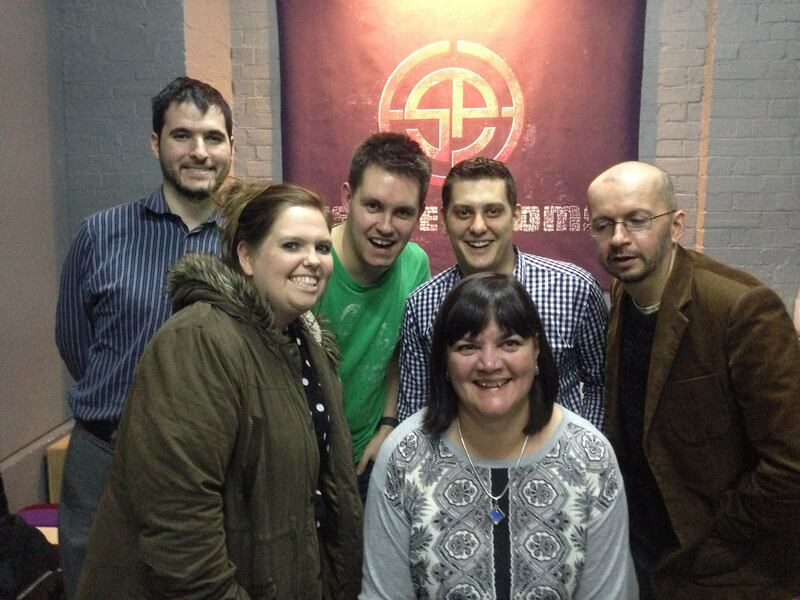 It also has one of the best co-operative puzzles we’ve solved. Escape Land has one puzzle room. 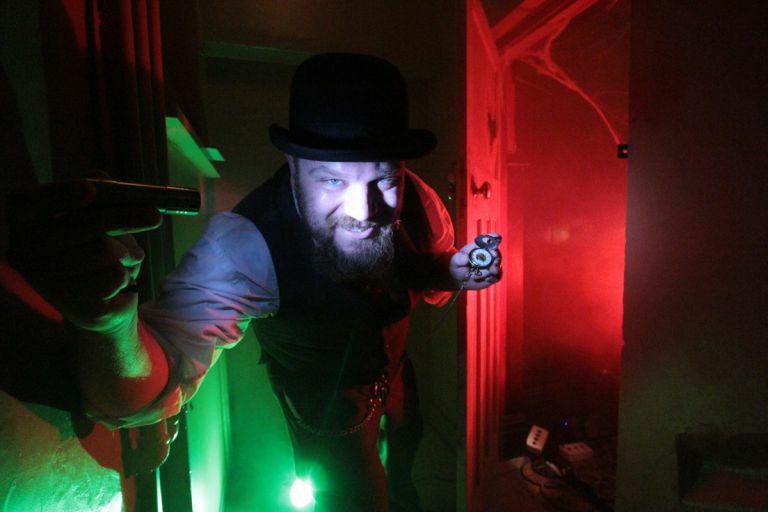 This company’s permanent home in a pub has allowed Handmade Mysteries to go all-out with their theming and immersive multi-sensory game Lady Chastity’s Reserve. It’s like other escape games at the same price level, but turned up to 11. The game is quite linear, and suits smaller teams, but it’s technically very clever. Offering a bottle of wine as a prize for winners is a touch that I suspect other venues couldn’t get away with too. Handmade Mysteries currently have one game to solve. 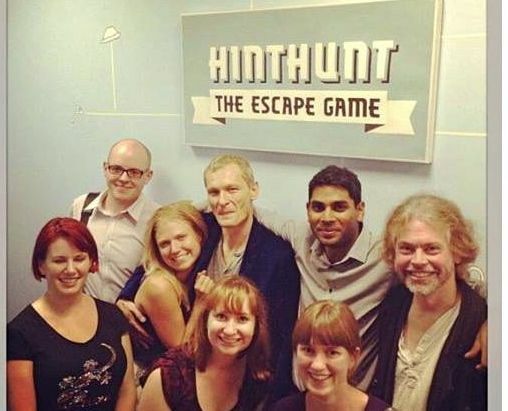 London’s escape game history started with HintHunt in 2012, and the game is as challenging now as it was then. Unlike most of the London escape rooms, HintHunt openly don’t expect you to be able to solve all of its puzzles within the hour. Clues are regularly sent to you via video screens inside the room whenever the operator thinks you’re getting stuck. This can make the room feel a bit harder than average, but it’s much closer to the original Hungarian experience. It’s only down to the game’s high difficulty that it’s not listed as one of our members’ favourites – they’re proud of the fact that the games have never been solved without hints, but I think a puzzle that can’t be solved without help shouldn’t be set as a puzzle. As Tripadvisor’s number 2 attraction though, there are plenty of people who disagree with me, and if that’s you, you’ll probably love the original London escape game. HintHunt has two puzzle rooms to solve, one of which allows racing between teams. In an unusual twist, a zombie starts chained to the wall, but every five minutes another foot of chain gets released, leaving an ever-increasing danger zone in which you could be caught. And once you’re caught, you’re out. With 12 people in the room this escape can get a bit crowded, and the story is contrived even by escape room standards, but I can promise you won’t get an adrenaline rush from any other game quite like this one. Room Escape Adventures has one room, but fits up to 12 players at once. Even without any stand-out features, these games still offer a solid puzzle adventure that’ll put you through your paces. The Victorian-style waiting room is a great beginning to a good set of co-operative puzzles, but the build quality of the room when we played seemed a bit lacklustre for Escape Hunt’s above-average prices. They do have multiple versions of each room though, so you can race multiple teams against each other at the same time, more than anywhere else in London. Escape Hunt has three puzzles to solve, all suitable for racing between teams and some with up to four teams at once. There are some really interesting, novel puzzles at Hidden Rooms, even if some of the solutions felt a little obscure. Once the venue’s been running for a while and they’ve made time to focus on some of the details and improve the immersion, this could easily be a great venue. Hidden Rooms had two games to play: Chain Reaction and Prison Break. Lock’d is probably one of the best escape rooms for first-time puzzlers to try. Although there isn’t much innovation compared to other games on the list, and the theming is basic, the puzzles are a great introduction to the genre. The attention to detail is obvious in all of the games and all have very different storylines, so you get a different experience each time. Lock’d has two puzzles to solve for up to five players, with one more game coming soon. While not strictly an escape game, Mystery Squad’s The Death of Shelby Walters puts the same deductive skills to the test in a unique game of intrigue and unexplained circumstances. Mystery Squad is a unique take on the genre. There’s no room to escape: instead deduction, sleuthing and puzzle solving will help you unravel the puzzling death of Shelby Waters. Your final score depends on how much of the back story you manage to uncover from the extensive history that’s been prepared. Mystery Squad has one (extra mysterious) game to solve. Agent November is different from most other escape rooms in that you don’t have to escape – the game takes place outside in public areas. If you like the idea of escape games, but aren’t too keen on being stuck in a room, Agent November could be perfect for you. Instead the focus is on sleuthing, finding clues and solving the various mysteries. It’s a unique challenge: grab a slot in the summer! Agent November has two games to solve. Although we’re big escape game fans at thinking bob, there are still games we haven’t had time to get to. “It arrived without warning… we do not know where it came from… or why it is here.” So says the appeal for ‘curious, observant people’ to help the Mystery Cube scientists work out its origin and its purpose. Can you solve the riddle and escape the cube in time? Mystery Cube has one room (spoiler: it’s cube-shaped). 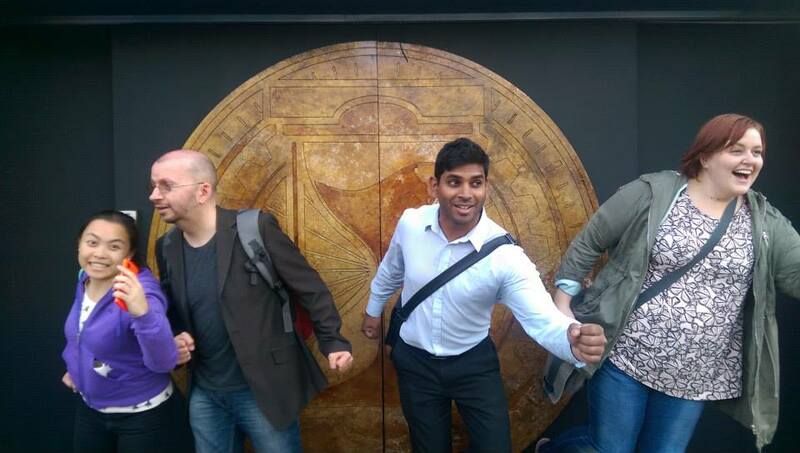 It would be impossible to talk about room-based games without mentioning the Crystal Maze experience that just completed its funding through Indiegogo. Bob is very excited about the idea of heading to the Crystal Dome. Thinking Bob member. Also prototyping webdev, occasional poker star, constant guitar hero. Emerging Machead, wannabe chef, light sleeper. Haribo lover, Jack drinker and IRC fan. How about escaping with Strangers? Join us! Escape rooms are a great way to get to know new people. Every week our members take on one of the rooms and get to know each other at the same time. What’s more, we get a discount at pretty much all of them! Sign up here! Think you could escape from a room with just your wits? 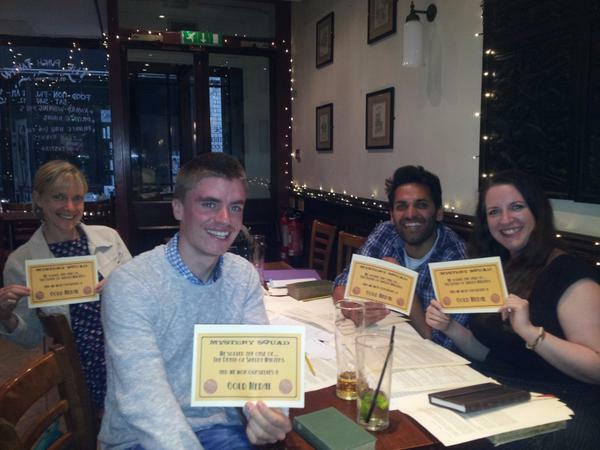 Why not have a go with our members and meet some friendly people at the same time? Check out our calendar and find out which one we’re playing next. Your first month’s membership is free and you can cancel any time: what have you got to lose?